Mars Hill native Bernard Patterson (center) is shown in this BDN file photo from Dec. 6, 1972, being escorted into federal court in Bangor by two U.S. marshals shortly after his capture and return to Maine. 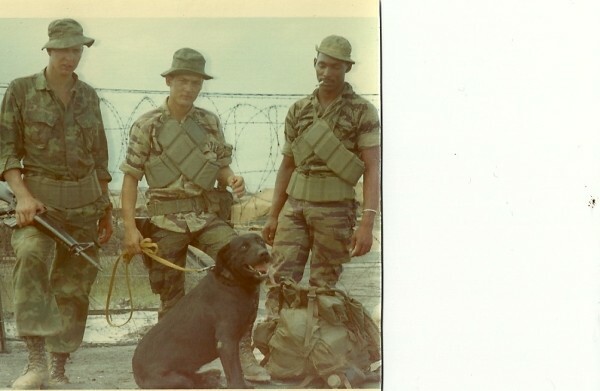 Mars Hill native Bernard Patterson (center) with two other Army soldiers and his assigned tracker canine when we was assigned to the 101st Airborne during the Vietnam War. 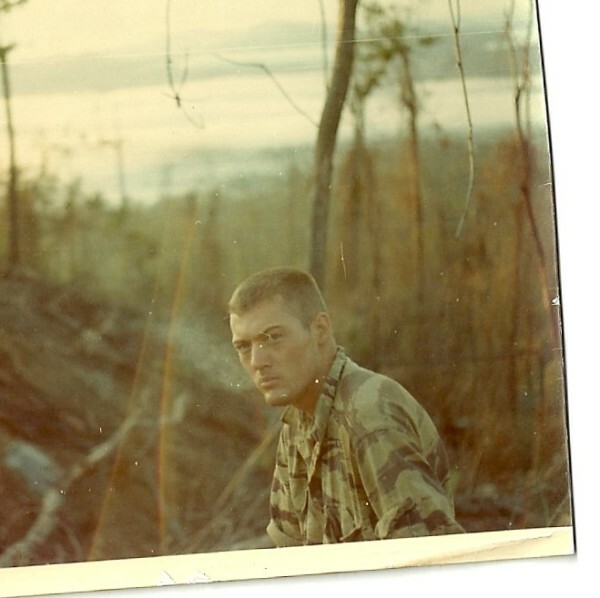 Mars Hill native Bernard Patterson seen while serving in the Army during the Vietnam War. The book cover design for Ron Chase's book published in February about Mars Hill bank robber Bernard Patterson. Ron Chase of Topsham, who wrote a book about Mars Hill bank robber Bernard Patterson. Why would a young man rob a bank in the town he grew up in and think he could get away with it? On Nov. 12, 1971 — 45 years ago on Saturday — then-24-year-old Mars Hill native Bernard Patterson did just that. Dressed with a reddish brown wig and armed with a toy gun, he robbed the Northern National Bank of $177,000 — more than $1 million in today’s dollars — and set off an international manhunt. It was a bizarre crime and the largest bank robbery in Maine history, perpetrated by a young Mainer whose life is worth considering as a whole for a better understanding of his generation’s experience and the experience of others today, according to Ron Chase, author of the book “The Great Mars Hill Bank Robbery: The true adventures of Maine’s zaniest criminal,” which was published in February. Patterson, who died in 2003 at age 56, was “a version of Don Quixote, Butch Cassidy, and Robin Hood,” according to Chase. A high school dropout, he was universally described as an intelligent, natural math wiz by teachers and people who knew him, Chase said. At the time of the robbery, Patterson was a former Army sergeant with four Bronze Star medals earned over three tours in the Vietnam War, where he embraced the dangerous job of “tunnel rat” and discovered marijuana, which he smuggled back to Maine. He was denied his proposal for a fourth tour — a sign to Chase of Patterson’s early post-traumatic stress disorder. When he robbed the bank, the teller knew it was him, but he still escaped. Taking a raft down the Prestile Stream en route to Canada, Patterson fell into cold water, hid out on Mars Hill Mountain for a week and hired a ride to Connecticut, according to Chase. From Connecticut, he flew to California and then, with a fake passport, flew to France — getting through customs with the money in tow. He spent a few months “living a life of excess in Switzerland and then escaped to England just 30 minutes ahead” of the International Criminal Police Organization, according to Chase. With a new motorcycle, Patterson then traveled across Europe, trying and failing to enter Greece, and then from Italy took a ferry to Tunisia, where he almost got lost in the Sahara Desert. He soon flew back to England and took a ferry to the Isle of Jersey, where he was captured by authorities from England in June 1972. Despite the historic crime and an aggressive prosecution, a judge, who was also a World War II veteran, showed Patterson some leniency, giving him an effective prison sentence of 15 years when the maximum punishment would have been 30. Although he was released from prison early, in 1977, Patterson was significantly aged by his time in a federal prison in Lewisburg, Pennsylvania — still a notoriously violent penitentiary. “Of all the things I did in Vietnam, I was never more afraid than in prison,” Patterson said at one point. Prison did offer him another education, in the business of growing marijuana. And when he was released, Patterson and his then wife moved to a cabin in Westfield, where he grew marijuana. They had a daughter, but the marriage did not last. He lived out the rest of his days in the cabin, successfully evading authorities searching for his dwarf marijuana plants, while succumbing to alcoholism and eventually a heart attack. 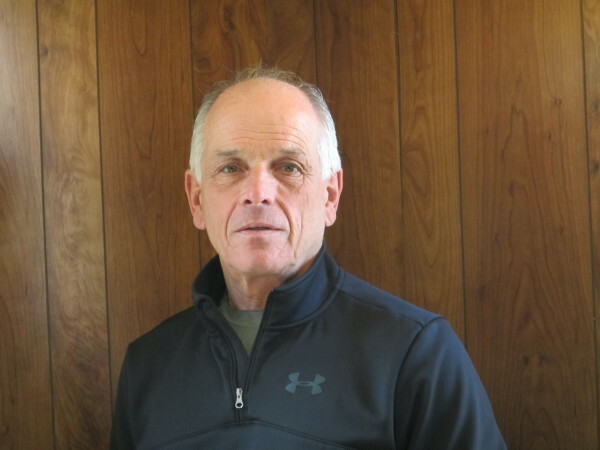 Chase never saw active combat during his military service in the Vietnam era and ended up becoming an employee of the Internal Revenue Service and a registered Maine guide. He nevertheless felt a kinship of sorts with Patterson. “We both returned [from military service] disillusioned, distrustful of our government institutions and with an abiding sense that we no longer fit neatly into the society we had left,” Chase writes in the prologue to the book. “I realized that Bernard was a very complex character and there was also a very sober, compelling aspect to his story,” Chase said. The story is meant to be entertaining — it may be turned into a movie — and Chase hopes people will enjoy it as a story. “I hope they’ll also come away with a greater appreciation of the impact that PTSD has on the lives of many of our soldiers,” he added. “The Great Mars Hill Bank Robbery” is published by Down East Books, and can be found online and throughout stores in Maine, including Merchants on the Corner in Presque Isle, Briar Patch in Bangor, Bridgton Books in Bridgton, Beyond the Sea in Lincolnville, Mustard Seed in Bath, Longfellow Books in Portland and Books a Million locations in Auburn, Bangor and South Portland.